Bob Chitester, founder and chairman of the board of the Free To Choose Network, will speak at the University of Arkansas on Thursday, Dec. 6. Friedman is recognized as a champion for the free enterprise system and individual rights. In 1976, he was awarded the Nobel Prize in economic sciences. Friedman is widely known for his landmark 1980 PBS series Free to Choose and his best-selling book by the same title. Chitester last spoke at the U of A during a campus visit in January 2018. He is best known for creating the public television series Free To Choose. Free To Choose Network includes a production arm, Free To Choose Media; an educational initiative, izzit.org; and a publishing arm, Free To Choose Press. He also oversees The Milton and Rose Friedman Center for Advancing Human Well Being through Free Market Capitalism at Capitaf, the former Vermont summer home of the Friedmans. 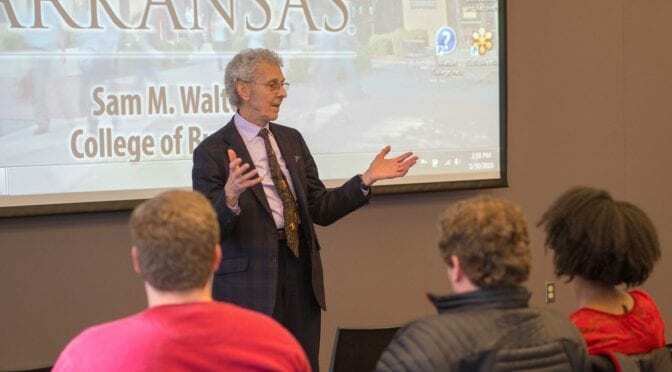 Another in a series of University of Arkansas students will attend a four-day colloquium there in August 2019.